The Creative Sound Blaster Roar Wireless Bluetooth Speaker is now available for Indian consumers. Priced at Rs.15,999 at Amazon India the speaker offers portability and powerful sound. Check its features before you decide to bring one home. 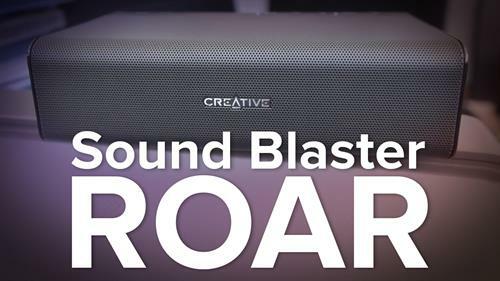 Creative finally launched the Sound Blaster Roar Bluetooth Speaker in India for Rs. 15,999. The wireless speaker is available exclusively on Amazon India. The Sound Blaster Roar has a classy black and grey exterior, with smooth, well-rounded edges and perforated body. It's a fairly compact speaker, measuring 2.2 x 7.9 x 4.5 inches. It weighs a little over 1.1kg; and is not the lightest of speakers. The Creative Roar comes with dual amplifiers – one for the highs and the other for the mids and lows. One amplifier has triple 3-inch drivers for the bass and the mid-range, while the other amplifier is powered by two 1.5 inch drivers. The Sound Blaster is not as steeply priced as the Jawbone's BIG JAMBOX and the Bose SoundLink Wireless Mobile Speaker; but it definitely compares to them when it comes to look and feel. The Bluetooth speaker is as practical as it gets, with a lot of functionality packed into it. When paired with a smartphone the Sound Blaster can also act as a 'speakerphone'. It can understandably be synced with a smartphone or a tablet using Bluetooth, but in addition to that its also possible to sync another device with it. This means that the controls of the speaker can be divided between two separate devices. Other en-suited features include NFC connectivity, one-touch audio recorder as well as a Bluetooth Link Security Control. The Link Security Mode comprises of a default setting for single user with 2 Bluetooth devices, a friendly access mode for Bluetooth users that have synced their device to the speaker and a Free-for-all access mode, which allows connection to the speaker without authorization. The features don't end there. The Sound Blaster can also be used as a USB computer speaker by installing apposite software on the system. The 3.5 mm auxiliary input jack on the speaker can be used for connecting the two. A Micro Secure Digital (MicroSD) slot enables WMA and MP3 audio playback and recording. When the speaker is plugged into a computer the MicroSD slot acts as an SD card reader, enabling recording of music playing through the Roar onto an SD card. There is also a USB port on the speaker that functions as a charger; it can be used to charge smartphones or any other USB device. The 'Alarm' and Life-Saver' modes are something unique in the Sound Blaster Roar Bluetooth Speaker. The purpose of the Alarm that sounds much like a police siren is not understood. The Alarm can be turned-off by the flick of a switch, and its volume can thankfully be adjusted. The Life-Saver mode on the other hand has two fixed settings. One setting shuffles the music and plays it at full blast; while the other reduces the volume to the ¾ mark. Chances of the unique features mentioned in the previous segment having baffled you are high, but don't give up on the Roar yet. The device supports HD audio codecs of AAC and aptX and provides superior acoustics over Bluetooth. It is a great device to own if you consider the sound quality. It offers perfect clarity of sound and balance; making it a downright outstanding speaker. Creative provides pre-set audio settings for games, movies and music. But, these can be overruled by selecting master sound options and adjusting the equalizer. When smartphones or tablets are being used they need to be paired with the speaker via Bluetooth, and the Roar is ready to go. When the Roar is being used as a speaker for Windows or Mac computers the sound can be tweaked using the control panel. Battery life of a portable speaker is a crucial deciding factor on how good the device really is. The Sound Blaster Roar has a 6000mAh battery that proves to be good by that standard. It is being touted of giving 8 hours of continuous battery life when used as a speaker alone; which is a lot of juice. It takes nearly 3 hours to fully charge the Roar. 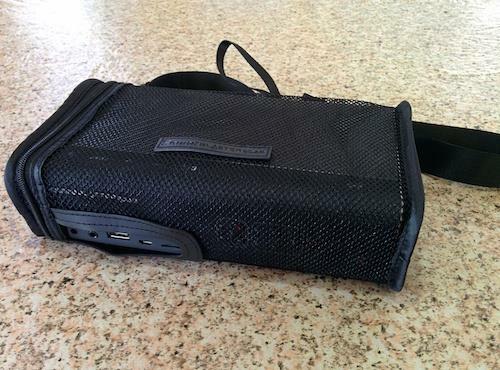 The Sound Blaster Roar comes with a netted carry-bag that has shoulder and hand straps for transportability. The bag lacks wadding, so it isn't meant to protect the speaker in any way. Although, the meshed bag is a good idea since it doesn't distort or muffle the sound. There is one minor problem with the Roar - the connection ports and controls are at the back of the device. So, each time you need to make adjustments or do something, you will need to access the rear. Further, there are no flip-covers on either the SD card slots or the ports, making them disposed to collecting dust and/or tiny insects. 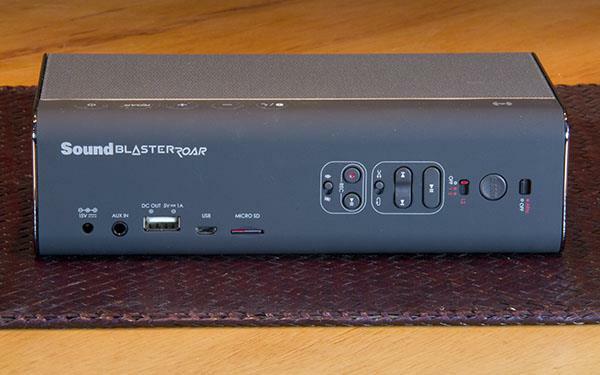 Other than this minor hitch, the Sound Blaster Roar is a good portable speaker to own. The battery life is top-notch and the sound quality impressive. Additionally, it offers a range of functions, keeping it in-tune with the other quality speakers in the market. Good initiative from Creative really. Though the product has a few hitches, it would really make a good buy given the pros enlisted by you.